Lock in a great price for Alpin Resort Hotel – rated 8.2 by recent guests! Stuff service was very good! I ordered lamb for dinner and it was one of the best. Breakfast perfect! Great location, really nice and clean rooms, and extraordinary staff! Everybody was incredibly helpful and generous with their time and advice. Overcharged, when checking out staff asked for an extra £600 as room prices changed from when I booked and paid in advance! They then suggested we settle for £300 extra! The whole argument took 90mins which almost made us miss our flight! Breakfast is fine (although coffee is not good at all). Shuttles to ski slopes and back are frequent. Good ski rental facilities with very nice and helpful staff. Overall a positive experience, but the lower level staff do not exactly have the correct mindset. Great concierge and parking amenities. Good location for skiing, 20 minutes walk into the main skiing centre and restaurants/ bars. Lovely views from the room, good sized room and a nice powerful shower. Reception staff were friendly and helpful. Good location, great pool and sauna, very good breakfast, large suite 150m2, two bedroom plus amazing living room, two bathrooms, and great balcony. Central location in town , Apartment with huge balcony and a great view on the snowy mountains, good selection at breakfast , great pool ! And a couple of restaurants on site for dinner . The apartment we have booked was really spatious and cosy; Great facilities - large pool, nice sauna and a full day shuttle service to the slope; Diverse breakfast; Good food at the restaurant. 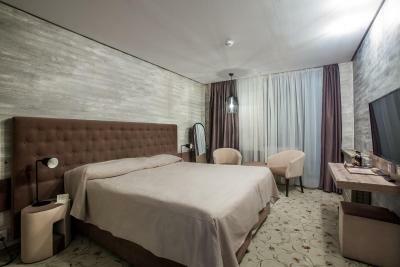 Alpin Resort Hotel This rating is a reflection of how the property compares to the industry standard when it comes to price, facilities and services available. It's based on a self-evaluation by the property. Use this rating to help choose your stay! 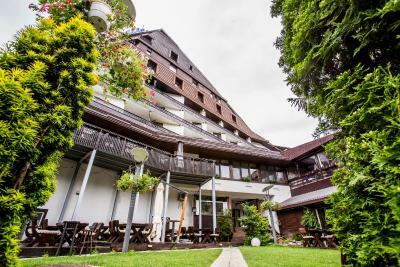 One of our top picks in Poiana Brasov.Centrally located in Poiana Brasov, 10 minutes on foot from the ski slopes, Alpin Resort Hotel offers accommodations with complimentary access to a semi-Olympic pool. In the winter, free shuttles to the slopes and back depart every 5 minutes. Free WiFi access is available. Most of the rooms have a balcony and some units enjoy mountain views. They come with a satellite TV, a mini-bar, a safety deposit box and a private bathroom. 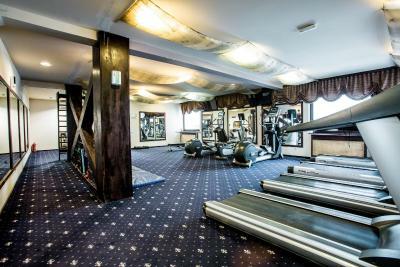 Alpin Resort Hotel consists of 3 interconnected buildings: Alpin Hotel, Alpin Casa and Aparthotel Alpin. The resort includes a large Spa Center, 4 restaurants 2 terraces and summer gardens, and 41 designated halls for conferences and events, accommodating 10 to 700 people. 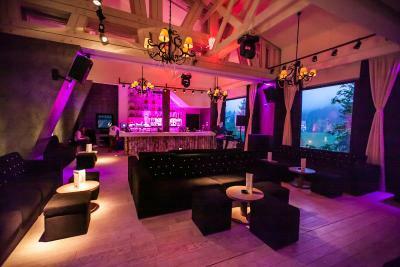 Further facilities include bars, a nightclub and 3 brand shops. 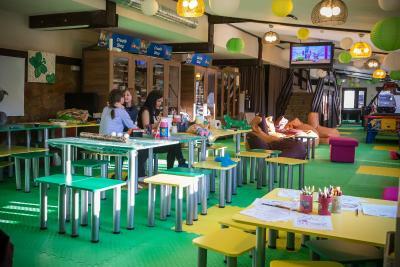 Guests also benefit from 2 children’s playgrounds indoor and outdoor, a children's pool and children's workshops. 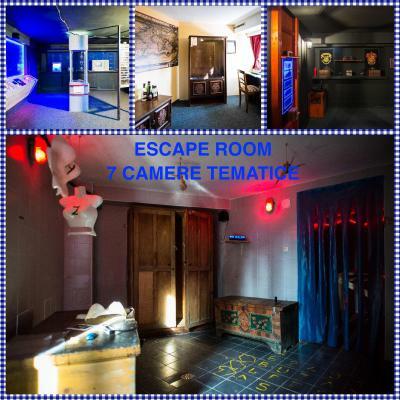 You will also find 6 escape rooms at the resort. Valet parking and concierge services are offered free of charge 24 hours a day. 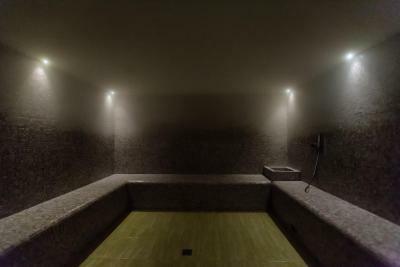 Among the facilities, you will also find a hot tub, weight lifting and cardio gym, a dry and wet sauna and an emotional shower. 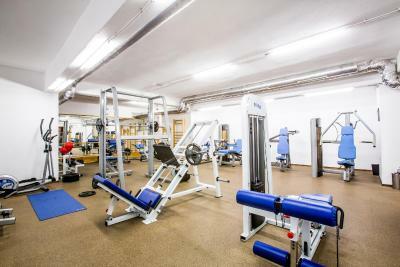 At the Alpin Resort, guests can find a ski school and ski storage in winter, a bicycle school and bike rental in summer, and hiking and trips activities throughout the year. 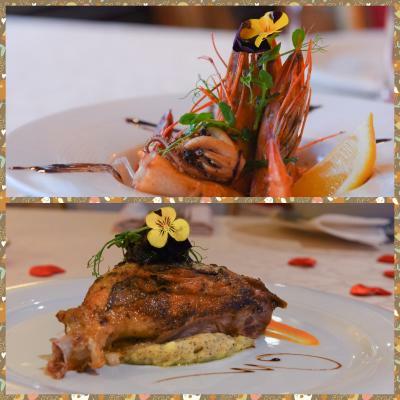 International food and fine wines are served at the À Propos restaurant, where guests can enjoy a view of the surrounding mountains. A rich buffet breakfast is offered every morning at the Tosca Restaurant. Guests can listen to live piano music, which is played daily from 17:00 to 19:00 in the reception area. 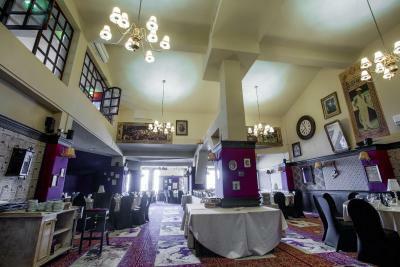 The Gatsby Italian Restaurant and the traditional Forest Restaurant offer a blend or Romanian and international cuisine. 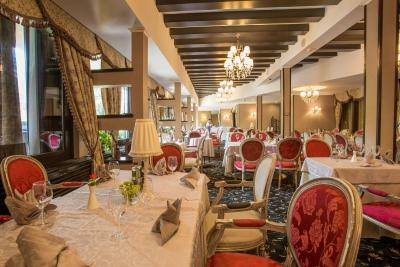 This is our guests' favorite part of Poiana Brasov, according to independent reviews. 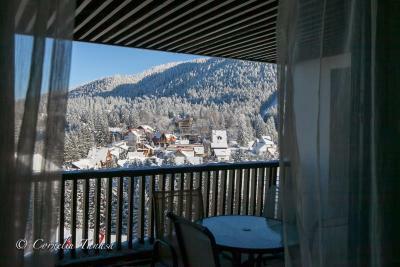 뀐 Located in the top-rated area in Poiana Brasov, this property has an excellent location score of 8.7! When would you like to stay at Alpin Resort Hotel? This air-conditioned apartment comes with carpeted floors, and a living room. The kitchenette is equipped with a microwave for preparing light meals and snacks, and tea and coffee facilities. Please note that the kitchenette is not equipped for cooking complex meals. This apartment has a balcony, air conditioning and mountain view. 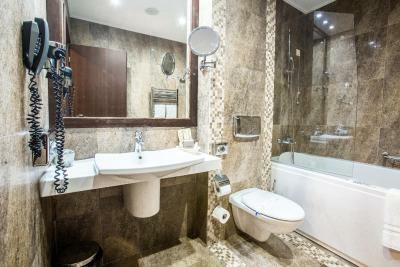 This twin room features a bathrobe, mini-bar and tumble dryer. 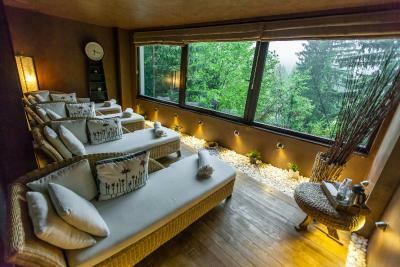 Hotel Alpin is one of the most modern 4-star hotels in Poiana Brasov where you can indulge your senses in one of the most modern Spa Center, then serve delicious French & Mediterranean dishes and high quality wines recommended by our sommelier. House Rules Alpin Resort Hotel takes special requests – add in the next step! One child under 12 years is charged RON 46.59 per night when using existing beds. All children under 16 years are charged RON 116.47 per night for extra beds. Any additional older children or adults are charged RON 116.47 per night for extra beds. Alpin Resort Hotel accepts these cards and reserves the right to temporarily hold an amount prior to arrival. Please note that on Mondays, the pool is open between 12:00 and 22:00. In all other days, the pool is open between 08:00 and 22:00. Please note that Alpin Resort Hotel requires your details in order to issue an invoice for your stay. The property will contact you after booking. Please note that holiday vouchers issued by Romanian Government are accepted at the property. 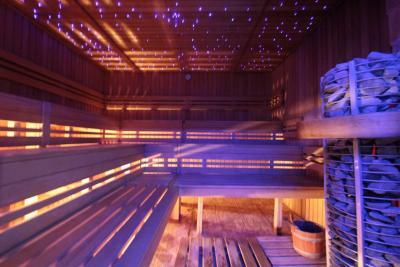 Mountain air and view from the room, friendly staff , wonderful food, fantastic spa rituals and atmosphere. Rooms were clean. Facilities were active and organized. Friday evening until Saturday afternoon we didn't had hot water! Starting Saturday afternoon just hot water :), probably to compensate. there was nothing to dislike! it is one of the nicest place in Romania! Staff, room was very clean, the food excelent, SPA was amaizing, great value for money. LOVELY STUFF, EXCELLENT FOOD AND DRINK AND AMAZING VIEW. THANK YOU , I WILL DEFINITELY RETURN . Quite a lot more than I would've thought. The staff was disappointing to say the least. My wife is pregnant and she was sick in the parking lot and a man came over not to ask us if we need help, but to ask me if my wife can go be sick somewhere else. The receptionists fumbled for 15 minutes to find my reservation (while I told them that my wife isn't feeling well and she needs to get to the room quickly), even though I SHOWED THEM my booking confirmation on my phone. 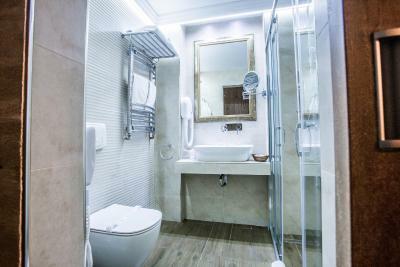 While the room was nicely decorated, on a top floor with a good view, the bathroom was not very clean. It looked old and overused. I wanted to take a bath in the tub, but honestly I was too afraid it didn't look clean enough. Even at the 7th floor with the window closed, we could hear party music from downstairs. At 1 AM. NOT OK. Either insulate the rooms better or turn down the music a little. Went to have lunch at one of the restaurants. We weren't very hungry and only wanted something simple (a soup). It wasn't very good. Honestly it tasted like it was left over from yesterday. It sure didn't taste fresh and I was struggling to remember another place I had eaten soup worse than this. It tasted like cantina soup, not 4* restaurant soup. I've eaten at the same restaurant before and it's always been more than ok. Maybe just don't serve soup if it's not fresh? We would've eaten something else if they had told us. Breakfast has an excellent selection, there's no way you can't find something you like. This hotel has a lot of activities and you can easily find something to do. Breakfast weren't very variable and delicious. Problems with parking places. It took a while to get a car back even with a help of parking vallet. Very good location. Transfers are organised on a good level which provides you with an easy acces to slopes. Just amazing service and staff attitude in ski wardrobe. Perfect spa. Astonishing view from rooms balcony. Plus nice bonus -cozy fireplace in room.